every year a large garden is planted at my parents house. this year the plants went in a little too late and most things are not growing very well. except the zucchini. 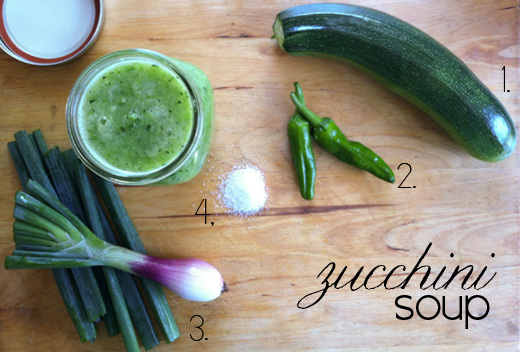 the zucchini will always grow. this soup is an easy way to use up all of that zucchini. it’s great for lunch now. and freezes well for lunch later. and you only need five things to make it. simply cut all of the veggies into chunks and place in a pot with just enough water to cover them. cook until tender. blend everything together in a blender or food processor. before you blend feel free to add some fresh herbs if you want. that’s it. the soup is tasty on it’s own or you can add salsa, sour cream, croutons or whatever else you would like before serving.